I finally made my Wikipedia edits. It was difficult to figure out how to insert specific references (footnotes), but fortunately there are some helpful pages for people who have no clue what they are doing. Bigfoot researcher and cryptozoology author Loren Coleman wrote about a series of thunderbird sightings in the 1940s. On April 10, 1948, three individuals in Overland, Illinois spotted what they originally thought to be a passing plane, but after seeing a large set of flapping wings, they realized this "plane" was something very different. A few weeks later, in Alton, Illinois, a man and his son saw what they described as an enormous bird creature with a body shaped like a naval torpedo. The creature was flying at at least 500 feet and cast a shadow the same size as a small passenger airplane. Similar sightings around the same time in St. Louis, Missouri prompted residents to write concerned letters to then St. Louis mayor Aloys P. Kaufmann demanding that the city do something about these reportedly huge birds. The mayor instructed an administrative assistant to set a trap to catch one of the creatures, but when blue heron tracks were discovered on an island in the Meramec River, the mystery was considered solved. In 2002, a sighting of a large birdlike creature, with a wingspan of around 14 feet (4.3 m), was reported in Alaska. The Anchorage Daily News reported witnesses describing the creature like something out of the movie Jurassic Park. Scientists suggested the giant bird may have simply been a Steller's sea eagle, which have a wingspan of 6–8 feet (1.8–2.4 m).There had also been previous reports of similar creatures in the same area around that time. I will post next week on my edits to the thunderbird entry on the Monstropedia site. The britannica encyclopedia states that a mermaid is a, “fabled marine creature with the head and upper body of a human being and the tail of a fish.” It also goes on to say that they loved music, lived long lives, were mortal and had no souls. 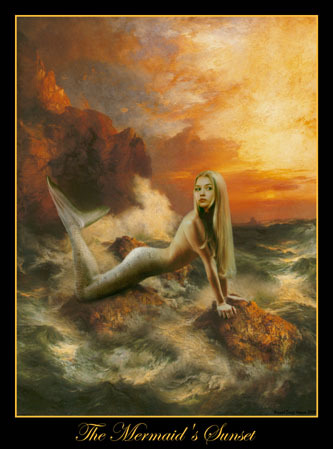 Everyone seems to have a popular image of a mermaid, one containing a female with golden hair, bare-breasted, with a green scaly like tail starting at the waist. But not every description matches this popular idea. Some accounts describe mermaids as pale, almost pure white with long green hair mixed with seaweed, webbed fingers to aid their swimming, and gills on their necks. Their tails descriptions vary from green to silver and from scaled to smooth. An Irish mermaid, Liban, was described with a tail like that of a salmon. Yet, Henry Hudson’s logbook described the tail as that of a porpoise. Mermaids are said to carry a “magic talisman” that appears in the form of a belt, comb, mirror or even a cap that is the source of their power. Their vain nature is shown by the long hours they spend staring at their reflection in these objects. Occasionally, humans were bestowed one of these talisman in order to pay for a debt, or summon the mermaid to which it originally belonged. However, if a human stole this object rather than have it given to them freely, the mermaid would be powerless to return to the sea. One problem I have with these stories, is they keep talking about mermaids not returning to the sea. Where are the accounts with their human lives then? I'm spending my Mother's Day weekend scrambling to present my monster and subsequent research process, but I volunteered to go early, so I can't complain too much. I'm finding now that I wish I'd been a bit more methodical about collecting and organizing my finds. Once again, I've gotten scattered. I've seen and read many things, but haven't kept very good track along the way. I've continued to email myself links and research documents. Looking back on our requirements, I wish I had been printing screens as I found them on the web. It appears that either my keyboard or my wanky printer or both are not configured to us the 'print screen' option. so I suppose it wasn't a complete wash. When first starting my research I decided to look at books because I figured if I had to use Summit of ILLiad I should start the process early. However, to my surprise, within the Western Washington University library there were a number of books on vampires. The first three that I will examine are all from university presses while the last three are not. The first book I found was The Vampire: A Casebook edited by Alan Dundes. This book is a compilation of essays by many researchers in the field including Katharina M. Wilson of the University of Georgia, Agnes Murgoci, a zoologist and folklorist with a PhD from the University of Munich, Jan Louis Perkowski, a professor of Slavic languages at the University, along with many other highly reputable sources. 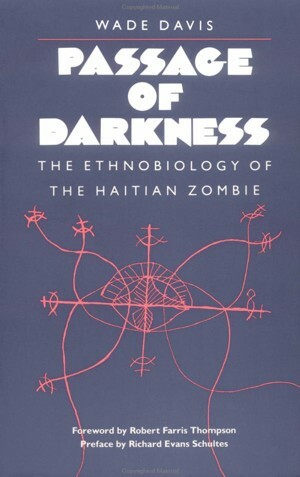 Section titles include "The Vampire in Roumania," "East European Vampires," "The Killing of a Vampire," and "Clinical Vampirism: Blending Myth and Reality." From reviewing these sections this book is extremely helpful in looking at the origins of myths and what they consist of. By looking at the cultural differences in each myth a consensus can be reached about the basic attributes of vampires, as well as the differences around the world. Another important and interesting thing about this book is that it brings the older arguments and brings them into the present. In the article "Clinical Vampirism" we are able to examine modern issues surrounding the vampire and try to understand the ideas behind the creature better. This book was published by the University of Wisconsin Press in 1998. Taking this into account we can learn two things about this book. The first is that it is scholarly enough to be printed by a university. This gives us the idea that the information in this book has been peer reviewed and is good for use in further research. This is a definite plus. On the other hand, the second thing we discover is that it was printed over twelve years ago. This means that some of the research could be out of date or some of the essays might have been revised as new evidence has come to light. One thing I could do to follow up my research in this book is to look up more recent writings by the authors of the articles in this book to seen if there has been any more progress in their research. 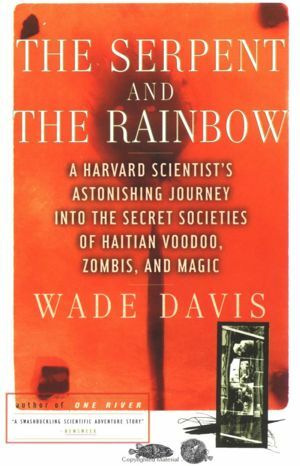 Overall, this is a reliable book and I see it as a credible source in my research process. This is mostly because of the fact that it was printed by a university press, the backgrounds of the authors, and the fact that it focuses on the culture and mythology surrounding the idea of vampires so they can be looked at as real creatures. Today was the day I was going to find a great resource for my report/blog and I was determined as ever as I approached the infamous Western Library. I had found several resources or potential resources related to my monster, The Mermaid… Before taking classes led by librarians I often thought of librarians as quite quant and perhaps shy, but mostly of nice elderly woman that knew a lot about the library. Two classes later I have concluded that my original assessment of librarians to be false, but rather wide of the mark. This particular morning I was extra eager and excited to start my day by spending some time with my local librarian. She started out extremely nice and helpful and one could even say, a bit too helpful. I happily showed her my most recent discovery of a potential source on the WWIU Library page and she seamlessly provided the professional and expert guidance any lost student has come to expect. Upon completion of our research I was provided some information that would help me locate my potential research and was happy to be on my way. My journey or wild goose chase as I have so reluctantly labeled it led me to the oversize journal section in Hagard 3. Very interesting section of the library, the one good piece concerning this section of the library is that you walk directly pass the beautiful and awe inspiring planetarium! After spending about 45 minutes searching journals and desperately looking for the information that our local, wonderful librarian provided I concluded that I didn’t have sufficient information to help me locate this potentially vital piece of information. Not being satisfied I decided to return to our local librarian to inform her of my progress or lack of progress. She politely chuckled and with a devilish smile said, “Oh, I guess you need more info then just that”! As I found her very attractive and pleasant I played it off and continued my efforts in narrowing my search and getting the missing link from our now jokester local librarian. Now in hand I had the actual call number which seemed to be the final piece of this puzzle and would ultimately lead me to impending victory, but alas. It was not to be, several hours later and several volumes later I concluded that I had officially been led on a local librarian wild goose chase. Considering I always perceive the glass half full vice half empty I took several important lessons with me from this encounter. Tim Dinsdale also disputes the claim of this photograph as a hoaz in his book “Loch Ness Monster.” He claims that the studied the photograph so often and from many different angles that he was able to discern objects that prove the photograph is not a hoax. He states “upon really close examination, there are certain rather obscure features in the picture which have a profound significance.” Two of the obscure figures are: a solid object breaking the surface to the right of the neck, and to the left and behind the neck there is another mark of some sort, Dinsdale states. After making this claim Dinsdale dicusses that these objects are too hard to tell what they are, but that just proves that they could be part of the monster. According to Dinsdale either the objects are part of a very subtle fake or genuinely part of the monster. Another object that he points out to prove the photograph is not a fake is the vague smaller ripples that are behind the neck, which seem to have been caused after the neck broke the surface. Dinsdale emphatically states that this is a part of the animal underwater behind the neck. All of his facts prove that it is possible that this photograph is not a fake, at least according to Tim Dinsdale. All is all it was an interesting assignment and now I can say that I have edited a post on Wikipedia. Now to sit back and wait to see if someone deletes my entry. Oh the suspense! It was obvious from the beginning that Monsterpedia was a pitiful resource, when compared to Wikipedia--both in content and style (the actual prose was poorly composed, written in a simplistic, superficial style). 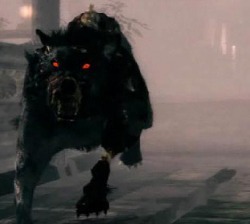 The beast of Gévaudan didn't even get its own entry in Monsterpedia--rather, the creature was briefly mentioned in the werewolf article, simply as a French "encounter with were-wolves." (Monsterpedia) A few details follow, but they are of little consequence--merely a vague recap of information available from just about any source that mentions the beast. The introduction of the Wikipedia on the beast contains same information . The article as a whole is better written, more organized and comprehensive. The single details focused upon flow chronologically, beginning with the attacks and flowing into the second beast's death. After this, there's more information still, not directly related to the beast, but certainly tied to it in certain ways--there's information on its appearances in film and other forms of popular media, but also scientific ponderings on just what kind of beast the beast was. For obvious reasons, Monsterpedia had far fewer citations for Gévaudan--in fact, I couldn't actually find the source of the information that they used in the paragraph about the beast. The Wikipedia entry did contain a variety of sources, many of them quite reputable. While the majority of the books I discovered through Google books were either a. irrelevant or b. in French, I did find one good source; it told the tale of the beast in a narrative rather than academic style, honing in on specific events, telling the reader just how the small children were mauled, what body-parts chewed upon and other such glorious details we probably didn't need to know (yet still, morbidly, enjoy reading of). This particular book was The Complete Idiot's Guide to Werewolves, an interesting title to note, simply because though it's an idiot's guide, they're sure to convolute the nature of the beast (which, granted is as it should be, as no one's quite sure exactly what it was), stating that "there is no doubt that the Beast of Gévaudan existed…descriptions make it seem unlikely that it was really a regular wolf. Some have theorized that it was a species of prehistoric wolf (fossils of which have been found in China, Russia, Alaska, and California) forced to encounter humans, possibly due to a shrinking habitat." (Brown) The books does not, in fact, call it--plain and simple--a werewolf. "The Beast of Gévaudan." Wikipedia. MediaWiki. Web. 4 May 2011. <http://en.wikipedia.org/wiki/Beast_of_G%C3%A9vaudan>. Brown, Nathan Robert. The Complete Idiot's Guide to Werewolves. Indianapolis, IN: Alpha, 2009. Print. "Werewolf - Monstropedia - the Largest Encyclopedia about Monsters." Monstropedia - the Largest Encyclopedia about Monsters. MediaWiki. Web. 02 May 2011. <http://www.monstropedia.org/monster/Werewolf>. My last post was about my edit to the Spring-Heeled Jack info on Wikipedia. Unfortunately, my additions were almost immediately deleted by, DreamGuy. He/she stated, “Interesting if true, but not cited to any source, reliable or otherwise”. While the information I entered actually came from an academic, scholarly, and peer reviewed journal, History Today, I failed to site it in my edit to Wikipedia….OOPS. I give kudos to DreamGuy for catching my mistake, but I feel that if he was a real Spring Heeled Jack fan this information wouldn’t have been new. Since my Wikipedia experience, I have found several more books and articles on my cryptid. Just today, I received a book titled, The Lore of the Land: A Guide to England’s Legends from Spring-Heeled Jack to the Witches of Warboys. I found this book the day we were talking about encyclopedias and how there are many different encyclopedias for different subjects. In my search during that class, I stumbled upon this great book. Though there are only a few pages about the Spring-Heeled Jack in its total 915 pages, the information was detailed, specific, and supported information I have found in other sources. I didn’t find much information in newspapers directly relating to Bigfoot. Though there was a lot of material on things tangent to bigfoot, such personal relation campaigns for shows about bigfoot and news about companies who use bigfoot to help brand them. For example, on US 2, there is a espresso shop, “Espresso Chalet”, about 20 miles before Stevens Pass with a 12 ft tall carving of Bigfoot next to their stand. This might be something that helps bring in customers to support the remote business. In the article it says that the employees like to joke with the tourists about the “big guys” appearance, so it sounds like people notice the large carving. This article wouldn’t be considered relevant by any serious Bigfoot researcher, as there is no hard evidence. I had trouble with many articles while on my search for Bigfoot in the news. If I found something, most likely it was not relevant to my main focus of trying to find hard evidence, the pieces in the news focus much more on the qualitative side rather than the quantitative. So this week, since I have been experiencing some slight difficulties in finding newspaper articles I decided to actually begin drafting my paper, working with the material that I have already collected and beginning to craft something that is actually...umm...readable. I have found that in starting to write my introduction the Vampire Encyclopedia that I got from Summit is extremely helpful. From this I am getting most of my basic knowledge needed to write the intro and talk about vampires as a cryptid. Unfortunately, I find that my intro is a little rough around the edges so like a fine wine (and I can make this reference because I'm turning 21 in less than an hour) I am going to let it rest for a little while and come back to it so it can become what I want it to. Hopefully we'll have a working intro by next blog post...yay! So I've encountered a lovely problem when researching for more articles about my Black Shuck (also known as the Black Dog of England). It seems that another name for depression is "black dog", and so when I search for articles or websites that are about the Black Dog of England, I encounter many websites referring me to facts about depression. I think this is a good thing to note, because it makes it difficult to find articles because the system is fooling me! Besides that nice little throwback, I found a great website with a lot of information about the history of the Black Dog. It also mentioned a 2003 encounter, which is awesome, since I haven't come up with any information of an encounter that was recent. The 2003 encounter will be worth looking up. Next project!